Animal Planet’s latest submission to the lexicon of Great American Programming is Battleground: Rhino Wars, in which a group of paramilitary patriots journey to South Africa’s Kruger National Park to take a stand against rampant rhino poachers. With guns. The pitch for this show must have been a work of art. American aggression is a touchy subject around the world—so why not turn that state-of-the-art weaponry and battlefield knowhow to a cause that everyone can get behind—the rescue of adorable animals? There’s certainly nothing more patriotic than overstating your importance in the world. It’s galvanizing stuff. The only appropriate mode for responding to Rhino Wars is caps lock: AMERICANS WILL SAVE THE RHINOS! RHINO TEARS = AMERICAN TEARS! BIGGS IS SENDING HIS LOVE VIBES TO THE RHINOS! (Biggs is really sending his love vibes to the rhinos. Biggs also describes himself as a person who is uncomfortable if unarmed—who carries a gun to protect himself from the “real” animals, humans—who compares shooting things to a relaxing bubble bath. Biggs is a winner.) Regardless of anything else on the show, the earnest-bro schtick is nothing but heartwarming. These are men who thrive on a mission. But after a few moments of pure unadulterated patriotism, doubt starts to creep in, as doubt tends to do. The “COUNTER POACHING UNIT” is led by Saw, who affirms that “we make good things happen in bad places,” adding that “we’ve come to bring down the war on poaching.” About 20 minutes in, the members of the counter poaching unit start arming themselves with an assortment of rifles and handguns as well as rounds and rounds of ammunition—in the name of good over evil. But what are they going to do, kill all the poachers? Some countries do have a shoot-to-kill policy with poachers—but South Africa is described as regrettably more lenient, which makes it that much harder to prevent poaching. But then why do they have all the guns? This is a question that is never satisfactorily answered. Complicating this further is the disturbing revelation, again about halfway into the episode, that all of the poachers depicted are black African, while all of the rhino saviors (with the exception of Rob, ex-Seal) are white men, and this is South Africa, a country with a history of incredibly fraught race relations in the rather recent past. Rhino Wars is a show about rhinoceroses, not a show about race issues, but it does seem that the complex issue of conservation and land use—the very system that determines the fate of this species, and polices the lives of the poachers—would merit closer examination. Indeed, the nuances of the poaching black market come into play even in this first episode. After a 24-hour crash course in bush survival, the team stays up all night for the full moon, what the rangers at Kruger call “The Poachers’ Moon.” The light makes it easier for the poachers to find their targets, which means that our team has to be on alert. Throughout the night, the only suspicious activity is a car coming down a road late at night. The team confirms that they have received no “intel” about the car, which immediately flags it as a potential threat. When the (ex-)soldiers approach the car, it slows down, honks, and then speeds off. The team concludes that the car is a scout—someone sent ahead to see if the coast is clear. This is verified later when they find ammo in a second car driving into the park—the hypothesis is that the first car alerted the second car, which then jettisoned its rifle to avoid suspicion. Got all that? Maybe not, because it is largely conjecture, anyway. Clearly, there is some complex system at work here, where many poachers know to work together to get around the system. This is may be evil, but it is certainly calculated evil, and it merits further investigation. But for whatever reason, there is much left unsaid in Rhino Wars. If this were not a reality television show—if instead, this were a scripted drama—this would be a highly engaging pilot. Our endearing macho men are understandably clueless about their mission. Their internal moral compasses are just waiting to be complicated with the many shades of gray between “good” and “bad.” They each seem to be coming to this for different reasons—either because on one hand, they’re bored and like guns, or on the other, because they’re truly moved by the idea of saving the rhinos. There are a lot of questions here about what their rights and responsibilities are—are they allowed to shoot the poachers? What happens if they do? Who’s responsible for them, the South African government or the American government? Who are these rangers, really, and what motivates them? In the HBO version of Rhino Wars, one of these soldiers himself would start trading in rhino horn—indeed would be using this mission as a cover for his own black market activities. Another would enter into a romance with the woman who runs the rhino orphanage. In the climactic season finale, a local man, perhaps even a black South African, would accuse them of neocolonialism. The leader might go on a journey to discover who, exactly, is driving the black market for rhino horn. The team would be forced to confront their place in the world. And it would be fiction, and so not necessarily bogged down by the questions of real-world laws and logistics. That would be an entertaining show, well worth watching. As it is, it remains to be seen if Rhino Wars is worth watching. The format does not inspire confidence. Right now, the show is a little less National Geographic, and a little more Operation Dumbo Drop. As explosively entertaining as the combination of rhinos and soldiers is, the back half of the première meanders—there isn’t enough exciting footage to prop up the hour-long episode. Partly this is because the team is successful. Their hefty presence deters poachers, if only for one night. But partly this is because the show appears to be at least for now uninterested in moving past the central idea of sweeping in to save a species to look at the broader context of this world. Unfortunately, this will hamstring the show in the end. As fun as it is to label some guys as good and others as bad, the modern viewer expects a little more. Rhinos are probably a universal good, but it rankles a bit when the audience doesn’t get a chance to decide that for itself. If anything, Rhino Wars seems to be much more about what Americans think they can accomplish with guns than it is about rhinos. The team members’ interest in weaponry (“major hardware”) overshadows their interest in the land they are living in. On one hand, Rhino Wars demonstrates the most ideal version of our military—powerful men who can exercise might for right. At the same time, in the show’s careful omissions, it’s clear that militarism is a blunt instrument, one that can be ill-suited to solve a complex problem. Rhino Wars revels in the former with gusto, but it’s hard to join in the fun. Rhinos actually do cry. This is an upsetting detail. “What’s happening is we’re caught between the elephant and the lion.” Just another day in the bush. 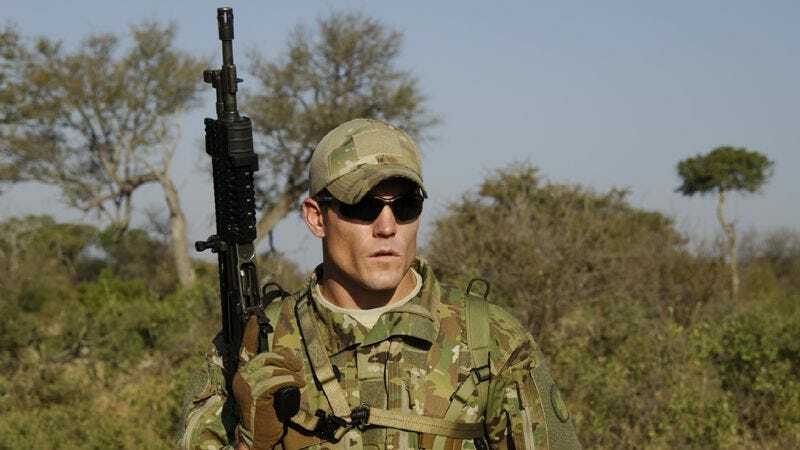 During one of the training exercises, former Green Beret Oz roleplays as a lion while his teammates act to scare him off instead of goading him to fight. It’s very funny.